Thoughts on W! Cecilia build? 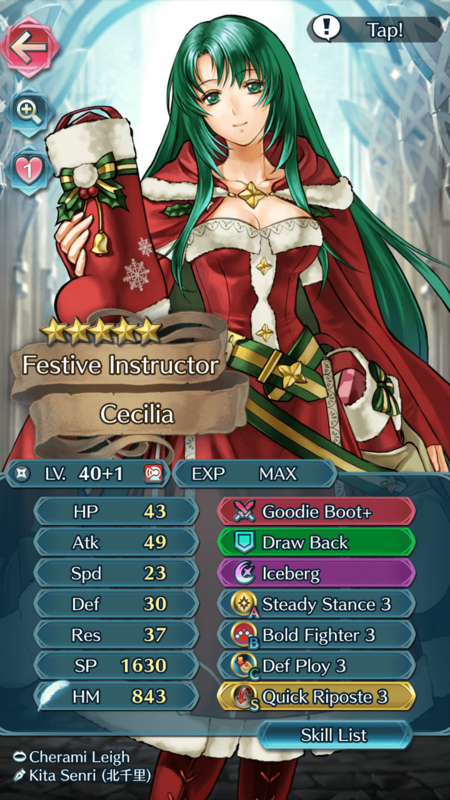 I just wanna hear your thoughts on my winter Cecilia build that I made. I was planning on giving her a defense refine once I get enough stones. Looks good to me. Has a good player and enemy phase. Looks good. I use mine for all enemy phase tanking in AR. Wary fighter, attack smoke, and Res goodie boot to take mage hits. Works well but Reinhardt is still a nuisance on her even with Wary. With yours as BF, she is better than min Eph player phase. Mine is great at taking hits and debuffing, but cant kill well on her turn like yours.